Originally reported in late January, a red tide bloom that caused over 100 tons of rock lobsters to beach themselves on the western South African coasts a few hundred miles north of Cape Town, may still be occurring. 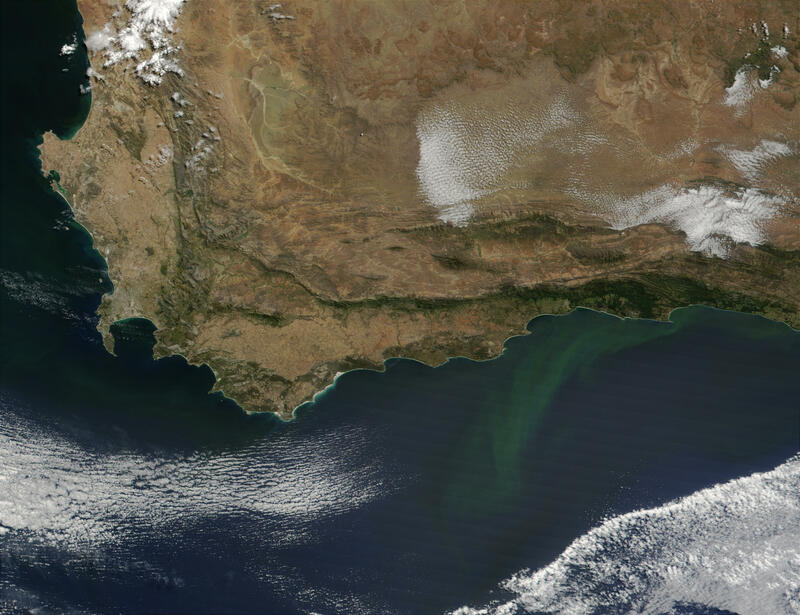 This MODIS image, acquired on March 8, 2002, shows highly colored water along the western and southern coasts, at least some of which may be the result of harmful species of phytoplankton that can devastate fish and other marine creatures in a variety of ways. In this image, there is a bright green plume extending southward from the forest-covered coastline right of the image's center. At the left of the image, the ocean appears very dark, but close inspection reveals some structure and swirls. Microscopic marine plants called phytoplankton house pigments called chlorophyll, which absorb large amounts of visible light, and where they exist, the ocean can take on a very dark appearance.